I'm fortunate, in that our family roots run deep. Generations of my ancestors preceeded me in my home town. We've had homes stay in the family for multiple generations. Therefore, we are blessed with a collection of family artifacts. A distant cousin compiled a book of family history, story's, documents and photographs. This particular picture is a favorite of mine. The couple in the middle are my great, great grandparents, Thomas and Susan Kern Ray. They are surrounded by their TWELVE grown children. And count them... there are TEN boys! These twelve were born between the years of 1864 to 1885. I like this photo because I can't look at it without putting myself in my great, great grandmothers shoes for a moment. C'mon, try it! Can you imagine raising twelve children in the late 1800's. I'm surprised that woman had the strength to sit erect. She's probably just shy of 60 years old in this picture. If I just imagine the LAUNDRY, I nearly break out in hives. It had to have been done on a washboard - I can't believe she was ever done. I imagine her expecting the 7th or 8th child with all those little ones. The work it must have been to take care of them, keep them clean and fed - it just exhausts me. She also educated them all. In her shadow, my life looks like a never ending party. The book was put together by Susan's granddaughter. She quotes her mother as saying that Susan insisted to all her children that "You might not have any money, but MAKE SOMETHING of yourself". 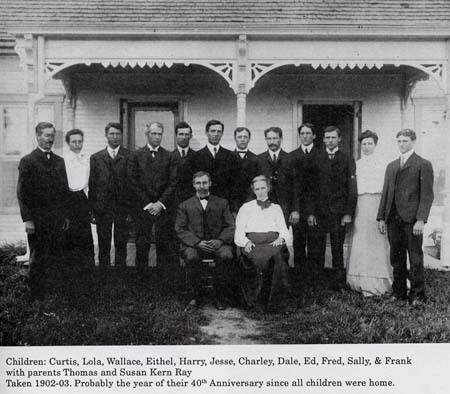 All twelve children became professional people, many of them educators. There's one story that stikes me among the many. It qoutes my grandmother telling that one of her uncles had stopped in to see her father(Curtis). He felt he needed to hurry home because "Ma" (Susan) was alone. Alone? "Yes, there's only Dale, Ed, Fred, Sallie and Frank, and they aren't company!" Think of it, home with five of her children was ALONE. This woman deserved a truckload of Calgon. I think how I was tickled when my THREE finally went back to school this week. I've got to count my blessings.